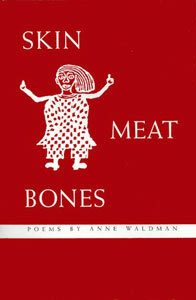 The verse in this collection is meant to be read aloudalongside the title poem are pitch instructions: “‘skin,’ high soprano register; ‘Meat,’ tenor; ‘bones,’ basso profundo.” As if they were notes, Waldman plays with words, with their sounds and rhythms, placing them in various configurations within the poetry, which makes the verse disjointed, destroys coherence and strains comprehension. But the sound of each word seems to be crucially important to this poet: “Words remain in memory/ their essential simplicity & strength/ likeopen air & fresh water elements.” Several pieces digress meaninglessly from their theme. Only a few succeed as poems qua poems. The rest must be read aloud.